Ubuntu 14.04 “Trust Tahr” is released and It’s time to upgrade. Backup all the important files/configs/ etc. The upgrades usually go smooth but that doesn’t mean you shouldn’t have backup ready, in case anything goes wrong. Remove proprietary binary drivers for graphic cards (Nvidia/AMD) etc as the linux kernel version will change in 14.04, the older graphic drivers may not work. So, it’s better to uninstall them before upgrade and reinstall after upgrade. And reboot the system. and follow the upgrade instructions. And you should see 14.04 available in update manager. Click on “upgrade” and follow the instruction. And of course, you should reinstall any proprietary drivers if removed earlier. 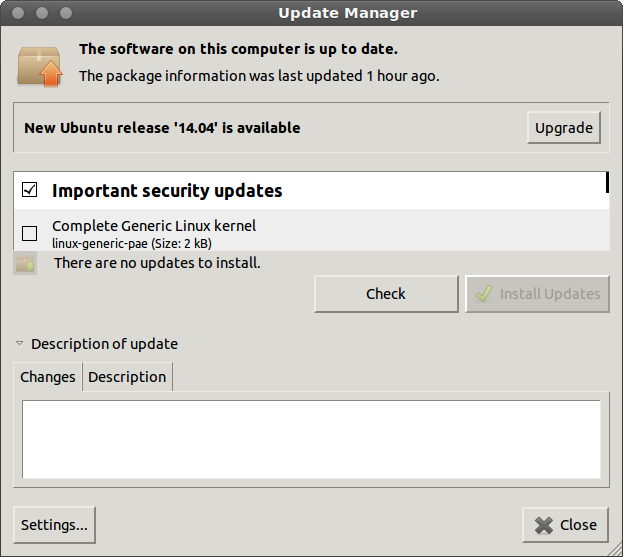 Note : If you don’t see the message “New Ubuntu Release ‘14.04’ is available”, then you may need to check settings and enable the option that says : notify me about new ubuntu version for long term support version. Ubuntu 14.04 LTS is released! Ubuntu 14.04 (code named as Trusty Tahr) is released. It’s a LTS release, so, it will be supported for next 5 years (the earlier LTS edition (12.04) was released two years ago). If you move from LTS to LTS (as I do, for primary development environment), then it’s time to upgrade. What’s new in Ubuntu 14.04 “Trusty Tahr” ? In the latest Ubuntu 14.04 Desktop edition, the default desktop environment Unity has improved a lot. Now, you can easily change menu bar settings to windows title bar instead of top menu bar, It also supports high DPI screens and text scaling as well, Improved screensaver and locked screen etc. So, before switching to alternate desktop environment like Mate/Cinnamon or GNOME, you should give it another try. You may like it. Although, new version of GNOME (3.12) will also be available soon. Here are some other changes/improvements in this new release. Read official release notes for more details and if you also want to know about the new features for Ubuntu 14.04 LTS Server edition. Improving the load time for a wordpress blog has lots of benefits – good user experience (faster page loads also results in more pageviews), better rankings in search engines (SEO), reduced cost (due to reduction in resource (RAM, CPU, cycles and bandwidth) usage) etc. So, if you run a wordpress blog/website that needs a little optimization you should follow this guide. But you need root access to your server. If you’re on a shared server, then first things you should do is move to a VPS; it’s cheap, faster and more secure and you also get full control over the server environment. I’m using Digital Ocean for this blog and I’m pretty happy with the performance (read my review on digital ocean and the article about setting up wordpress on vps server). They’ve plan starting at $5/mo, cheaper than most of the shared hosting providers. Signup using my referral link and get 2 months of free hosting – $10 credit to give it a try. Caching static resources such as images, css, js etc on the browser helps in reducing page load time on subsequent page visits.You can enable browser caching either using a plugin or manually. If you’re using Apache, then you can skip this step as Hyper Cache will do that for you (using htaccess config). Add these lines to enable browser caching with nginx. Save the file (Ctrl x and y) and reload the nginx server to apply above configuration. Using CDN for jquery has many advantages. It reduces load/bandwidth on your server, low latency for users (since the jquery will be downloaded from the CDN end point near to your user, that means faster download) and lots of other people use it, So, it may be already cached in user’s browser (best case). First you need to find out the jquery version you are using, so you can specify exact version from below.